While we already previewed the state of the 3G and 4G LTE mobile networks in the US in terms of speed, and compared the new contract-less ways to deliver those bits and bytes to you, there is one pretty important metric left to size up Verizon, AT&T, T-Mobile and Sprint against - network latency. Carriers typically boast with their services based solely on bandwidth in Mbps and/or coverage, stressing on the area where they are strongest at. Rarely do they mention how long does it take for those data packets to get called and reach their destination, or the actual latency. Here the proverbial "the more the merrier" doesn't apply, as you want the network latency to be as low as possible, indicating that those websites, online games or video, will reach your phone or tablet as fast and in as steady a flow as possible. Thankfully, we have the crowdsourced mobile traffic data from OpenSignal for Q4 2015 ready, and it gives a pretty good overview of the real network latency for Verizon, AT&T, T-Mobile and Sprint's networks. 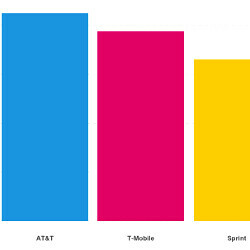 As we have seen before, Sprint's tri-mode LTE network boasts the lowest latency, followed by Verizon, T-Mobile and AT&T. Venturing outside of LTE networks will net you the lowest latency figure if you are a T-Mobile subscriber, as its HSPA+ network managed to stay just a tad above 100ms, followed by AT&T, then Verizon and Sprint, whose 3G standard delivers inferior ping rates. True to be honest they're all pretty good. Actually, I would say latency matters more than most anything else. Download speeds of greater than about 2 mbps should be good enough in most cases, but what makes it feel faster is speed at which your request is received and sent from the other server. Someone smarter than me can correct my inaccuracies, but right now I don't care about faster speeds, I just care about better coverage and lower latency. basically Sprint is best for gaming.